if you follow me on pinterest you may have noticed that i've been pinning bathroom pictures like crazy. we're in the process of redecorating our guest bathroom and i've got glamorous and elegant written all over it. so when Arcadian Home Decor offered to do a guest post on Glam in the Bathroom i thought the timing couldn't be more perfect. "Greetings all! I’m Jenn and I’m a proud member of the team at Arcadian Home Decor, an e-commerce website that specializes in beautiful home decor trends from across the globe. My first job after graduating from the Journalism program was working as an editor for a home decor magazine, and since then, I’ve been hooked on home accessories, wall decor, furniture, and much more. I’m always on the hunt for great blogs, and Nuha’s site Habibi tops my list. Thanks for letting me guest post here today! This old-fashioned copper tub is the showpiece of this elegant bathroom. The oversized mirror, architectural detailing, and ornate wallpaper are also oh-so-stately. Sometimes the unexpected is the best surprise, especially in home decor - this tub features a sweeping canopy instead of a shower curtain and instantly glams up this bathroom. A stainless steel tub, mirror, marble, and crystals make this bathroom not only opulent but very streamlined. The wood floors give the space a more dated feel. A massive white bathtub in the centre of the room looks even more relaxing with floating orchid petals. The chandelier adds old-world grace to this room with a view. A basic sink is beautified with shimmering textured wall appliqués, a silver oval mirror, and a fuchsia Lucite chair, perfect for getting ready for a night out on the town. This spa-inspired bathroom has floor-to-ceiling windows to take advantage of the incredible surroundings. The tub also gives this organic minimalist space a conversation piece. 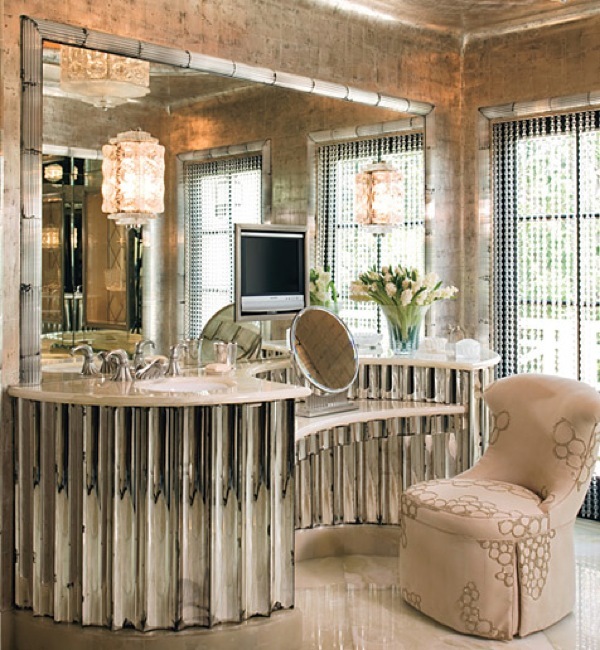 The accordion-style vanity is the obvious focal point, but the beaded curtains and unique wall coverings also make this bathroom doubly memorable. 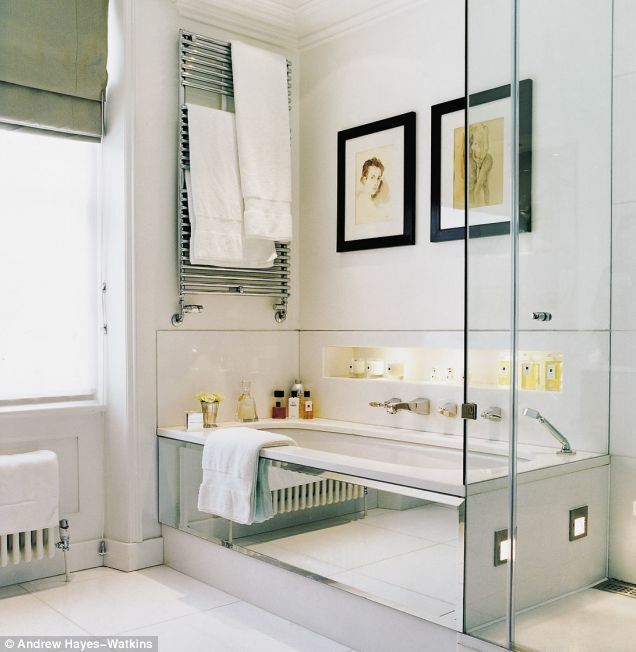 Sometimes a simple bathroom can be glammed up with a few extras, like a towel warmer, mirrored edging, a glass divider, and a built-in ledge perfect for toiletries. For more glamorous ideas and inspirations, stop on by at the Arcadian Home Decor blog and check out their tips on how to make your ordinary bathroom fabulous -- with their endless lists of products such as table decorations, metal wall art, and more!" a big thanks to Arcadian Home Decor. which picture is your favorite? i'd love to take a bath and lounge around in the first bathroom. le sigh. love all of them - i'm terrible picking faves!! Just joined interest, guess i'll be looking you up. :) Love the chandi's in these pics.